One of the most common ways for you to increase your network is by using LinkedIn’s functionality and suggestion system that it calls “People You May Know.” Given all the data that LinkedIn imports and the global network it maintains, LinkedIn can use people’s profile data, e-mail imports, common experience or education, and LinkedIn activity or other commonalities to help predict who may be in the same network with you. The People You May Know feature exists in several places. A section of your LinkedIn home page news feed is dedicated to it, as well as the top section of your LinkedIn Connections page. 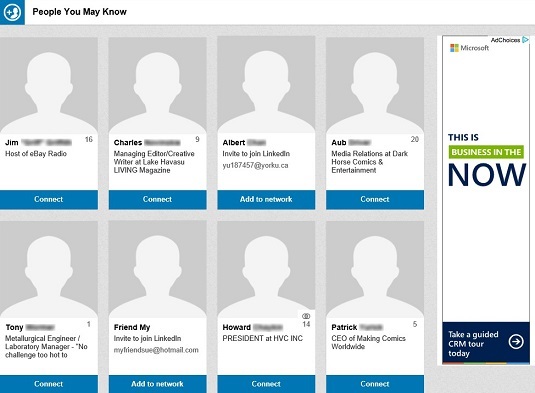 As you click Connect for one person on your Connections page, LinkedIn will update that spot with a new potential connection for you to consider. 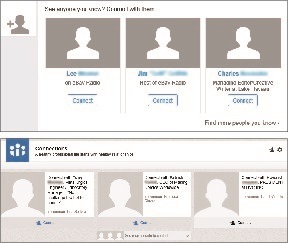 LinkedIn asks if you know people to add to your network. The most useful page for using this feature is the dedicated People You May Know page or by hovering your mouse over My Network from the top navigational bar, then clicking on People You May Know. As you scroll down the page, LinkedIn will automatically update the page by adding rows of people you can send connection requests to via its system. Review the People You May Know page on LinkedIn. Study the connections you have in common. A little symbol and a number at the bottom right corner of someone’s picture indicates that you and this person have shared first-degree connections. You can hover your mouse over that number to see a pop-up window of those connections. LinkedIn will automatically sort people with more shared connections to the top of the page, assuming that if you have a lot of shared connections, perhaps that person belongs in your network. Some people have an Add to Network button. If you see an e-mail address and the Add to Network button instead of the Connect button, that means this person is a contact that you imported to your LinkedIn account who isn’t currently on LinkedIn. If you click the Add to Network button, LinkedIn will send that person an invitation to join LinkedIn. You can spend a minute, an hour, or any time in between reviewing your connections. This is not something you should dedicate large chunks of time to, but every once in a while, visit this page to see who you may want to connect with on LinkedIn. Visit a person’s profile first and then click Connect. This can’t be stressed enough. When you click Connect from the People You May Know page, LinkedIn sends that person a generic invitation. If you click her name and then click the Connect button, you will see a screen where you can write a customized message.